Shannon Menard is a Public Relations Intern at Power Digital Marketing and a Marketing Intern at eSUB Construction Software. Keeping on top of new and emerging trends in the construction industry not only helps keep your company from falling behind, but also helps prepare you for the future. With the continuing growth and evolution of the construction industry, companies must stay up to date if they want to remain competitive. 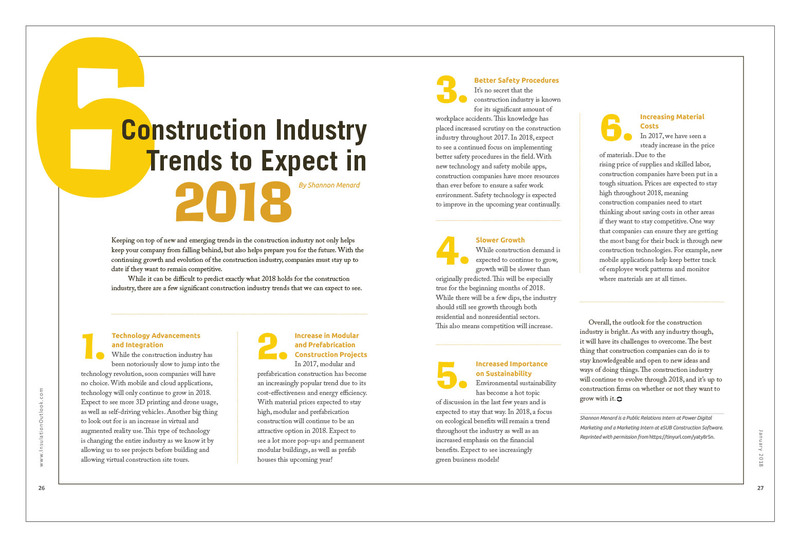 While it can be difficult to predict exactly what 2018 holds for the construction industry, there are a few significant construction industry trends that we can expect to see. While the construction industry has been notoriously slow to jump into the technology revolution, soon companies will have no choice. With mobile and cloud applications, technology will only continue to grow in 2018. Expect to see more 3D printing and drone usage, as well as self-driving vehicles. Another big thing to look out for is an increase in virtual and augmented reality use. This type of technology is changing the entire industry as we know it by allowing us to see projects before building and allowing virtual construction site tours. In 2017, modular and prefabrication construction has become an increasingly popular trend due to its cost-effectiveness and energy efficiency. With material prices expected to stay high, modular and prefabrication construction will continue to be an attractive option in 2018. Expect to see a lot more pop-ups and permanent modular buildings, as well as prefab houses this upcoming year! It’s no secret that the construction industry is known for its significant amount of workplace accidents. This knowledge has placed increased scrutiny on the construction industry throughout 2017. In 2018, expect to see a continued focus on implementing better safety procedures in the field. With new technology and safety mobile apps, construction companies have more resources than ever before to ensure a safer work environment. Safety technology is expected to improve in the upcoming year continually. While construction demand is expected to continue to grow, growth will be slower than originally predicted. This will be especially true for the beginning months of 2018. While there will be a few dips, the industry should still see growth through both residential and nonresidential sectors. This also means competition will increase. Environmental sustainability has become a hot topic of discussion in the last few years and is expected to stay that way. In 2018, a focus on ecological benefits will remain a trend throughout the industry as well as an increased emphasis on the financial benefits. Expect to see increasingly green business models! In 2017, we have seen a steady increase in the price of materials. Due to the rising price of supplies and skilled labor, construction companies have been put in a tough situation. Prices are expected to stay high throughout 2018, meaning construction companies need to start thinking about saving costs in other areas if they want to stay competitive. One way that companies can ensure they are getting the most bang for their buck is through new construction technologies. For example, new mobile applications help keep better track of employee work patterns and monitor where materials are at all times. Overall, the outlook for the construction industry is bright. As with any industry though, it will have its challenges to overcome. The best thing that construction companies can do is to stay knowledgeable and open to new ideas and ways of doing things. The construction industry will continue to evolve through 2018, and it’s up to construction firms on whether or not they want to grow with it. Reprinted with permission from https://tinyurl.com/yaty8r5n.